Ready to reinvent your cell imaging routine? The Invitrogen™ EVOS™ M5000 Cell Imaging System brings simple, automated microscopy within reach. The all-in-one design includes a monochrome digital camera for high resolution fluorescence imaging, a unique and proprietary color brightfield illumination mode, precision optics, a full suite of fluorescent filters, intuitive software, and more. The EVOS M5000 Imaging System is powerful, yet offers the simplicity of plug-and-play. It requires no warm-up or cool-down periods, allowing you to capture images in minutes. The environmentally safe, mercury-free LED lights are rated for 50,000 hours and afford exceptional stability and durability—you can turn the unit on and off whenever you need to image a sample. The long lifetime and low energy consumption translate into significantly lower operating costs compared to instruments with conventional light sources. 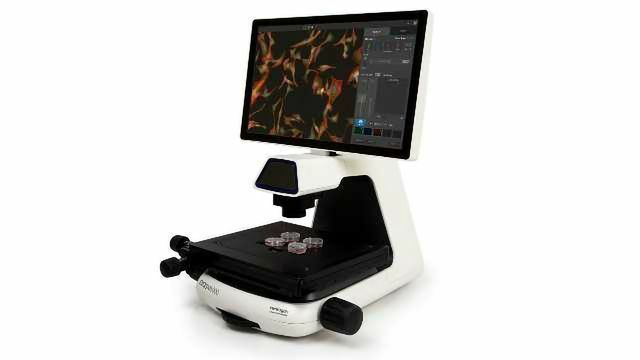 Designed by biologists for biologists, the EVOS M5000 microscope is remarkably easy to use. Following seamless image acquisition, you can analyze, edit and annotate your images using a set of convenient tool available in both live mode and for saved images. For common applications we have created easy-to-use image analysis tools driven by sophisticated segmentation algorithms; with a few clicks you can get a total count of your DAPI-stained cells or an estimate of confluence for reproducibility when you split your cells. Once you have edited and analyzed your images, save the images and data to the embedded hard-drive, an external USB device, a local network or to the Thermo Fisher EVOS Image Analysis cloud app. Connection to the Thermo Fisher cloud gives you access to images and data anytime and anywhere.